Stage1: Plaque sticks to teeth which contains bacteria, mucin and sloughed epithelial cells. If not removed, minerals salts in food form a hard calculus on the crown of the tooth. The calculus irritates the gums causing gingivitis. Stage 2: The calculus at the base of each tooth changes the pH of the area below the gum line. Now bacteria can live there causing early periodontitis. The cementum, periodontal ligament and alveolar bone which support the tooth suffer. 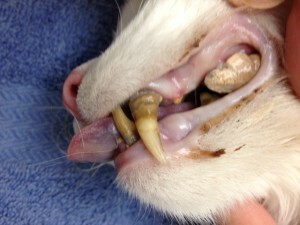 Stage 3: The periodontal disease is now established with destruction of 25 to 50% of the supporting structures. As my friend Dr. Bates likes to say, “the tooth is circling the drain in stage 3.” Even with aggressive treatment, many of these teeth will progress to stage 4. Stage 4: When more than 50% of the support structures are lost, the tooth is in advanced periodontitis. Removal is the only option now to make the dog or cat pain free. Bellows, Jan. “The Dental Care Series: Periodontal Disease in Pets.” VIN Published 6/14/2002, Reviewed/Revised 5/9/2007.